As many readers know, I’m a proponent of keeping an untapped home equity line of credit (HELOC) at my disposal for major emergencies. This isn’t my emergency fund. It’s what I call my catastrophe fund. I’ve always believed that keeping a HELOC readily available is the best insurance policy and the back-up plan for if / when the emergency fund runs empty. Think about it… being able to tap this money could buy us time in the event of job loss or illness. And time is money. Immediately after we bought the house, our mortgage broker had us refinance and get a line of credit from Citibank for $168,000. We have never used it. I list all the financial details to support my belief that we’re responsible borrowers. The HELOC is there strictly as a backup plan. For a catastrophe. Period. End of story. But with that said, I’ve always looked at that line of credit as my money. Money I could access at any time. So it came as a surprise yesterday when we got the letter from Citibank about our $168,000 line of credit: "We have determined that home values in your area, including your home value, have significantly declined. As a result of this decline, your home’s value no longer supports the current credit limit for your home equity line of credit. Therefore, we are reducing the credit limit for your home equity line of credit, effective March 18, 2008, to $10,000. Our reduction of your credit limit is authorized by your line of credit agreement, federal law and regulatory guidelines." Of course, I’m calling them today to dispute it. Why? Because unlike the Phoenix property, I believe I can prove our home has retained its value and hasn’t declined. But Newport hasn’t declined with any significance and if we compare current comps in our zip code, we can prove to the lender that our home has retained its value. Or so that’s my plan. I’m going to fight this one and I’ll write a follow up post about my success or failure with regards to the dispute. There are many amazing misconceptions in this story but let's start at the top. Ben Franklin is wrong. Credit is not money. Credit is credit. Nina in fact proves why credit is not money. Credit lines can be withdrawn while cash in the bank (below the FDIC limit) is cash in the bank. Above the FDIC limit cash in the bank may soon not be cash in the bank. For more on this idea please see Treasuries Safer Than Cash and Yield Curve Twilight Zone. Anyone above the FDIC limit at any bank needs to take action now. For a quick look at the idea that credit is money and homes are safe credit please consider WaMu Alt-A Pool Revisited. Since May of 2007, on a credit pool rated 92.6% AAA, 22.69% is now 60 days delinquent or worse, with 11.62% in foreclosure and 3.56% already in REO status. Clearly credit is not cash. Although that is just one pool, not necessarily representative of overall market conditions, but with that kind of action going on it's no wonder banks are cutting back credit lines. 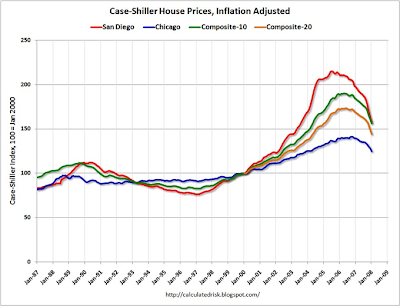 As far as overall conditions go, let's consider the Case-Shiller Housing Index from my post Chicago Area Foreclosures On Record Pace. Note the decline in the composite 10 and composite 20 market areas. The chart is inflation adjusted which arguably makes the chart look a bit worse, but the reality is home prices are declining in all major markets. Furthermore, housing has not yet bottomed. Please see Housing - The Worst Is Yet To Come and When Will Housing Bottom? for details. For an updated look at Florida, ground zero of the housing bubble bust, please read Grown Men Are Crying In Florida. It's a pretty shocking composite. Anyone making a statement "I’ve always looked at that line of credit as my money." should not be advising anyone on money matters. Borrowed money is not one's money. Once borrowed, the amount is debt owed to the lending institution or person making the loan. Nina is calling Citigroup to dispute. Good luck. Nina writes "When we bought our home three years ago, we put $300,000 down on the $1,100,000 purchase price. .... One reason why we bought in Newport is because we believed that property values would retain their value over time". It is highly likely that you are underwater on your house or soon will be. California is getting hammered. Anyone depending on "comps" is likely hearing what they want to hear. If by some miracle, your area is a pocket of strength it likely will not be soon. Home prices have dramatically outstripped affordability and have only one way to go and that is down. You can believe in the tooth fairy just as you can believe in your house, but that does not make it real. Look at this from Citigroup's point of view. You have decreasing home equity, most likely no equity. California is in decline with a long way to go before houses can be considered affordable. The US is in recession. You do not know the difference between money and credit. You do not understand the difference between your money and someone else's money. You spent $55,000 trying to "make a baby" (mentioned in the article). You are about to adopt a child instead (also mentioned in the article). Your cash went down and your expenses are clearly going to rise as a result of the last two points. The frightening thing to Citigroup and other lenders has to be the cavalier attitude of people who still do not see the freight train coming their way. Yes, you want the cash for "emergencies" but should an emergency arise (such as a huge loss in income) that forces you to sell your home after you deplete a $168,000 equity line, Citigroup would be on the hook for it. Most importantly, the "E" in HELOC stands for equity, (it is likely that you have none or far less than you think) and the "C" in HELOC stands for credit as opposed to your money. I suggest Citigroup is acting quite reasonably. Ironically, one reason lending institutions are looking to reduce credit lines elsewhere is corporations are in a mad scramble to tap their lines. Please consider Porsche, Sprint Unsettle Banks With Rush for Credit. Citigroup Inc., JPMorgan Chase & Co. and the rest of the banking industry face a new drain on their capital. Borrowers from Sprint Nextel Corp. to Porsche Automobil Holding SE to MGIC Investment Corp. are drawing on credit lines. JPMorgan analysts say it's the start of a trend that may force banks to raise as much as $40 billion to keep an adequate cushion against potential losses. Companies are scrambling for cash at one of the worst times for the financial services industry. The world's biggest firms have taken $195 billion in writedowns and losses on securities tied to subprime mortgages, and the 10 biggest U.S. banks have the lowest capital levels in at least 17 years, according to Credit Suisse Group. The tapping of credit lines may be enough to grind new lending to a halt, said David Goldman, a senior portfolio strategist at London-based hedge fund Asteri Capital. Banks had more than $1.4 trillion in untapped loan commitments as of September, the most since data became available in 1989, according to the Shared National Credit survey by four U.S. regulators including the Federal Reserve and Office of the Comptroller of the Currency. New York-based Citigroup had $471 billion at yearend, more than any other U.S. bank, according to regulatory filings. Charlotte, North Carolina-based Bank of America disclosed $406 billion of undrawn loan agreements and New York-based JPMorgan had $251 billion. Merrill Lynch & Co. had $59.3 billion. The added demand from borrowers comes as banks rein in lending to everyone from hedge funds to homeowners in an attempt to preserve capital. A mortgage fund run by David Rubenstein's Carlyle Group collapsed after creditors withdrew financing and Peloton Partners LLP liquidated a fund after demands from banks to repay loans. Leveraged buyouts have slowed to a trickle. Borrowers will be more inclined to tap credit lines as banks tighten their lending standards, according to Kevin Murphy, a money manager who oversees investment-grade and emerging-market bonds at Boston-based Putnam Investments, which has $65 billion in fixed-income assets. "It's a vicious cycle," he said. "The more that they tighten the lending standards, the more there will be certain stresses in the financial market. Any sort of unfunded commitments they've put out are likely to be called on." Sprint, which lost $29.5 billion last quarter, borrowed $2.5 billion in February from a $6 billion credit line arranged by JPMorgan and Citigroup, according to a regulatory filing. Sprint has $1.25 billion in bonds due in November and $400 million of commercial paper. "If they are short of capital at some point, banks may stop offering credit to borrowers that would normally qualify for a loan," said Anil Kashyap, a professor at the University of Chicago Graduate School of Business, and a former economist for the Federal Reserve. "That's the definition of a credit crunch." Nina may (or may not be) a good credit risk. I actually suspect she is. But plenty of so called good credit risks will no longer be good credit risks should an emergency arise. The prudent person needs to have a cash cushion of their own as opposed to a credit line should an unfortunate situation such as the loss of a job happen. Given that unemployment is extremely likely to soar, a sad day of reckoning is coming for the "credit generation". Those who lose their job and have little or no savings are in for a rude awakening: Cash is not trash but credit sure is.